What if you had control over whether or not you developed an autoimmune disease? Would you jump at the chance to change the course of your health? 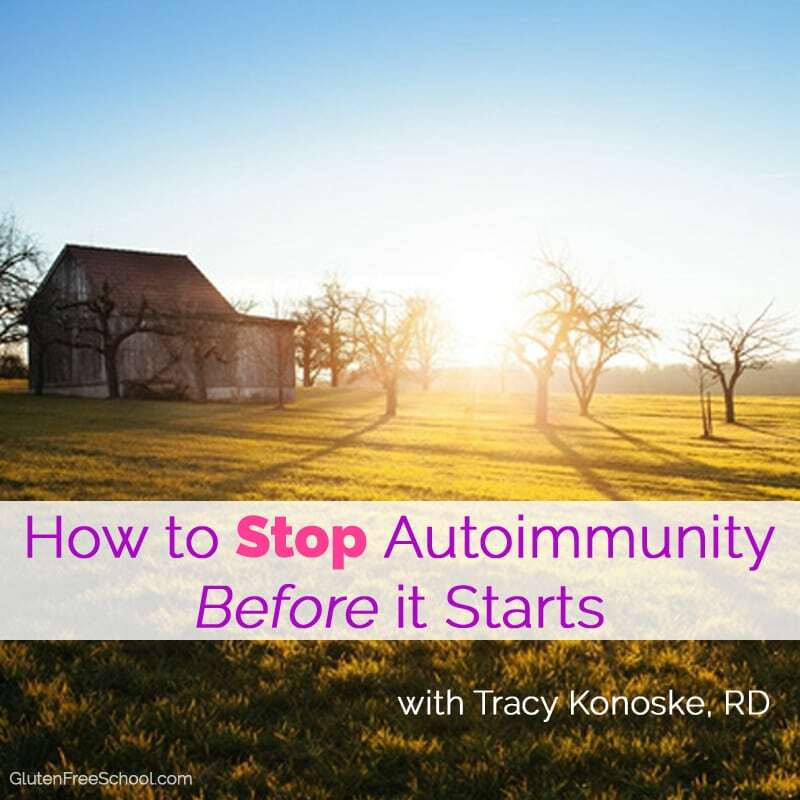 Tracy Konoske, MS, RD joined me to shed light on how you can stop autoimmune disease before it even starts. This is not a pipe dream, my friends. New research demonstrates that our bodies don’t just one day wake up in debilitating pain or some sort of horrible malfunction. Instead, it takes years for enough damage to be done so that testing, signs and symptoms conclusively earn you a diagnosis. By learning that a problem lurks below the surface, you can possibly change the course of where your health is headed. That’s why I just had to share with you how to stop autoimmune disease before it starts. 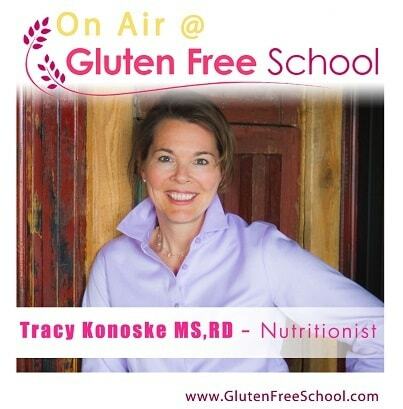 00:15 — Jennifer welcomes Tracy Konoske to the Gluten Free School Podcast to discuss how autoimmune disease can be predicted, halted or stopped. 01:39 — How Tracy’s interest in autoimmune disease lead her to a shocking discovery. 03:03 — Making sense of autoimmunity, its patterns and what it means for people with celiac disease. 06:02 — Autoimmune disease is on the rise, with mind-boggling stats to prove it. 07:32 — The perfect storm —3 predisposing factors to getting an autoimmune disease. 09:44 — Debunking the “Well, I don’t have Celiac, so I’m allowed to cheat” myth people who are gluten sensitive sometimes believe. 14:11 — The new paradigm, allowing us to forecast, or predict, the likelyhood of autoimmune disease. 17:20 — How one early-detection blood test can give you a 9-year heads-up, helping you determe if you have antibodies, predisposing you to other autoimmune diseases. 21:50 — How to get this testing done through your health care practitioner, and what to do if you can’t. 25:07 — Tracy’s final words or wisdom, for those concerned about a family history of autoimmune disease. 27:09 — Concluding thoughts and how to get in touch with Tracy Konoske. Jennifer: Welcome back to the Gluten Free School Podcast. I’m your host, Jennifer Fugo. Today, we are going to talk about how to forecast and stop autoimmune disease. So how you would know if autoimmune disease one, two, three, four, many? It’s really staggering. This is a really kind of a scary topic, but how you could potential see if that was in your future. Today, I have Tracy Konoske with me and she is going to share her experience in this area. Now, Tracy is America’s virtual nutritionist and a different kind of dietitian. She’s trained in natural integrative, functional and personalized medicine. She holds her master’s degree in nutrition from Bastyr University and is well on her way to becoming a functional medicine certified practitioner via the Institute for Functional Medicine. Tracy is successful in helping patients who suffer from migraines, IBS, joint pain and just about any autoimmune disease. And the really cool thing about Tracy, though she lives in the beautiful state of Montana, her private practice is virtual. So anyone anywhere in the world can go and see her and get some help from her incredible wealth of knowledge. Thanks so much, Tracy for joining us on the podcast. Tracy: Thank you, Jennifer for having me. I am delighted to be here. Jennifer: So I’m curious. What sparked your interest in autoimmune diseases? Tracy: Oh, that’s a great question. You know, I guess just because I see so much in my practice. I mean, there’s certainly an autoimmune disease in my immediate family. I guess if I were to go back about five years when I remarried, moved across the state, started my virtual private practice, I joined a forum and I learned about being able to halt, stop, reverse, et cetera, autoimmune diseases, which really piqued my interest. And it was through a test called the mediator release test (which I still use in my practice) to test or identify food and chemical triggers. And so fast-forward to today, we know that so much of the autoimmune process is driven by the digestive tract, the gut. But really, that’s maybe when it started because I became aware let’s say five years ago that if we could identify your food and chemical triggers, get them out of your diet and out of your life, people who were like a newly diagnosed type I were able to stop it right in its tracks meaning it didn’t progress. They might have still been on some amount of insulin, but not full-scale Humalog, Humalog with Lantus, the whole nine yards. So that’s when I really think it started. Jennifer: You talk about forecasting autoimmune diseases, which I think is really interesting. It’s sort of scary too because the rate of autoimmunity (at least just in the U.S.) is staggering. And unfortunately, it’s odd that the news, we focus on heart disease, cancer, diabetes and it’s not to say those things are not important, but the rate of autoimmunity is so high and competitive with them that for some reason, it doesn’t get mentioned ever. So what do you think we need to understand about autoimmunity in order to place what you’re going to share with us today in the right light, so they makes sense? Tracy: So let’s put down for your listeners that first of all, because they’re gluten sensitive people (either gluten-related disorder or Celiac) that people with Celiac may or may not realize that once you have one autoimmune disease, you’re likely to have more. Dr. Gerard Mullin from Johns Hopkins says that you’re statistically likely to have seven in your lifetime. Tracy: Mm-hmmm… and it’s because they co-mingle. So you know already that if you have Celiac, you’re at risk of type I and Hashimoto’s and rheumatoid arthritis. And if you’re still young, you’re at risk for juvenile rheumatoid arthritis. And then you get another little label called ‘multiple autoimmune syndrome’ meaning you have multiple. But the second point people should understand is that we only differentiate autoimmune diseases by the tissue that they attack. So you have an autoimmune process and you have Celiac (let’s just put that out there), but if we don’t stop that process meaning heal the leaky gut, remove the triggers, identify the cause of why you even have one autoimmune disease, it’s going to continue. It attacks the digestive tract and then it goes and attacks your joints. And now you have rheumatoid. It attacks the thyroid and you have Hashimoto’s. So the process is exactly the same. We have our own immune system attacking our own tissue. And whether that tissue is your brain or your gut, that’s the only difference. Does that make sense, that it’s the process that’s the same? Jennifer: It does. And it’s almost like what I’m hearing you say is that autoimmunity is like a fire in the middle of the woods. Once it’s started and it really gains a foothold in one area, it will begin to spread. And even though we might say, “Well, that’s the…” – we’ll make up names, “That’s the Sutcliffe Park fire,” those woods are on fire and this is the – I don’t know, San Francisco Bridge Park that’s now on fire, even though we might differentiate which parks and regions are on fire, it’s still one, big fire. Tracy: Exactly! That’s a great analogy. Jennifer: I don’t even know what to say. This is so shocking. The autoimmune disease rate is on the rise. Do you have any statistics that you can share with us just to kind of, again, place this conversation in something that we’re not hearing in the news? Tracy: So we’re now known to have 80 autoimmune diseases—distinct autoimmune diseases— depending on what literature you’re reading; some say even up to a hundred. And if you’re wondering how you could get seven autoimmune diseases, it’s because we’re now finding out that conditions like asthma, cardiovascular disease and even small intestine bacterial overgrowth (SIBO), which is part of that whole gut stuff, everything is turning out to have a component of an autoimmune disease. One of our functional medicine instructors, Mark Houston, says there are infinite number of insults out in the world (meaning chemical triggers, pesticides, that’s an enormous list), but there’s only a few things that the body can do with that. So imagine you’re being fired out with bullets all day long, your body can only turn that into an autoimmune disease, oxidative stress or inflammation. The simple point just being that everything, again, if we just come back to cardiovascular disease having an autoimmune component, the body has all these bullets flying at it all day long, but it doesn’t get to have all these different pathways. It can only manifest as so many different things and one of them is an autoimmune disease. Tracy: It takes three things. That’s a great question. Your listeners really need to understand this part. It takes genes. So people are going to have a family history. For your Celiac listeners, they’re going to perhaps have the DQ2 and the DQ8 because genetically we know that those genes set you up for a risk of Celiac. It doesn’t mean if you carry that gene that you’re going to have Celiac, that’s a different story. If you have HLAB27, you’re predisposed to ankylosing spondylitis. We’re beginning to discover which genes are connected to which autoimmune diseases. That’s by no means all completely figured out, but the point here is that it takes three things to get an autoimmune disease and one is your genes. Your genes are going to predispose you to mis-react to something. Let’s get through the three things, the trilogy. And then I want to come back to something that I think is important. The second thing that Dr. Fasano taught us (and I know you’ve had him on) is that it takes a leaky gut. You need to have some intestinal barrier issues because you can have – I mean, this is a classic for the people who do have DQ2 or DQ8. That’s the gene that predisposes you to Celiac. You can carry that gene and never go on to get Celiac just like you could carry the gene for breast cancer, but you never get breast cancer. It takes that perfect storm. So the genes, the leaky gut as Dr. Fasano has outlined. And then it takes some kind of trigger and that’s an endless list. The trigger could be gluten, it could be dairy, it could be stress, low blood sugar, genetically-modified foods, bacteria, viruses, the 88,000 chemicals that are now registered. It could be alcohol, which predisposes us to a leaky gut. The list goes on and on. There’s a couple of things about the genes I want to come back to assuming I made that clear. So it takes genes, leaky gut and some sort of trigger to catapult you into an autoimmune disease. Tracy: I want to make sure people understand that, again, just because you have a gene does not mean you’re going to end up with a disease because it’s going to take the rest of that perfect storm. And the other thing that I think is really important for your listeners to understand is that there are people listening who have a label on their forehead of gluten-related disorder and they think, “Well, I got my genes tested and I don’t have DQ2 or DQ8,” and then they think they can go through life cheating. I’m talking to your listeners right now and I’m also talking to my own followers because I have this conversation all the time with my patients. Gluten is connected to so many different conditions. What if you have the gene for multiple sclerosis or the HLAB27 for ankylosing spondylitis? My point is what if you have some other gene? You don’t have DQ2 or DQ8, but you have a different gene, let’s just say the HLAB27 and you cheat with gluten because in your head, you think, “Well, I don’t have Celiac, so I’m allowed to cheat,” you don’t get to feel an autoimmune disease until you’re years into it. We’re going to talk about that prediction processes of the spectrum of autoimmune diseases, but I really think it’s important that the listeners don’t just assume that this conversation is only for the Celiacs. This conversation you and I are having is for the Celiacs because they’re at risk of more autoimmune diseases once you have one. And because we don’t know everybody’s genes and we don’t have that all figured out, if you know you’re gluten sensitive, it’s really, really important I think. I think it’s really important if you’re sick to get away from gluten 100%, no cheating ever, no cross-contamination, end of story. There was a period of time many years ago where I thought that was okay. And now I realize – and for anybody out there especially if you’re at the beginning of your journey, this underscores the reason why you want to go tested for Celiac because I now live in limbo for the rest of my life. I could go get genetic testing, but Dr. Fasano said in the interview I did with him, “Really, at the end of the day, the genetic testing isn’t foolproof.” And you said that as well. Just because you have the genes doesn’t mean you’re going to end up with Celiac Disease. Unfortunately, I’m in the boat that I’m in, so go get tested if you’re at the beginning of your journey. If you have taken gluten out and you’re like, “Okay, I clearly react to it,” go to the doctor’s and get tested for Celiac at the least. Do yourself that service that I did not do for myself. I just didn’t know any better. I wasn’t educated and now I am where I am. But thank you for bringing that up. I think that’s a really great point. But what if you did have HLAB27? (You can’t list off all the other genes, they get more complicated than that.) What if you had the gene for MS and you’re cheating with gluten because you think in your head, “Well, I don’t have DQ2 or DQ8 so I can cheat.” Do you see what I mean…? Tracy: Everybody has a gene that predisposes them, so I think we’re all at risk. If you’re sick and gluten is part of your pathology and you know that you don’t feel great with it, you really don’t know all the genes that come to play and make up that perfect storm of turning into MS or gluten ataxia or rheumatoid arthritis. It could really manifest as anything. It depends on what your genes are. Jennifer: And I actually want to say thank you for that suggestion because I’ve spoken with a lot of people who work in this whole autoimmune space and they are advocates and experts and such, but I actually haven’t really heard it put that way that just because I would go maybe, say, get that test, that it’s really not –even if it comes back negative— it’s not the end-all, be-all because I don’t know what other genes I have that could be triggered. So that’s a really great, important point. Jennifer: Why don’t you tell us a little bit about this idea of how you can forecast or predict an autoimmune disease? Tracy: I have to give my gratitude to Melissa Arbuckle. She is a researcher. And because the military services save the blood supply, she was able to go back through the blood supply of veterans back all the way to 1978. So she went through the charts. She found 132 veterans who were diagnosed with Lupus and because the blood supply was saved, she was able to go back for years and what she found is that there was 115 out of 132 that did have all the antibodies, which I guess means 17 people either were misdiagnosed (they had all the signs and symptoms of Lupus), but what she found is that the antibodies to Lupus were brewing an average of nine years. And so what we want to think about is that autoimmune diseases are on a spectrum. This is a completely new paradigm. I know your listeners are really savvy, but I don’t know if they’ve ever given much thought to this. In the clinical world, it’s pretty common that people hire us as practitioners and say, “You know, I got tested and I was ANA positive. And then I went back six months later and it was negative” meaning now, their antibodies are gone. They kind of come and go. But if you think about an autoimmune disease on a spectrum and on the left side, it’s zero. You have completely healthy tissue and on the right-hand side of the spectrum, at the far extreme, you have total tissue degeneration and deformation like if we’re talking about Lupus or people who actually have physical deformities or you have complete beta cell failure, if you have type I. In the middle, you have these antibodies that – I call it ‘brewing’. I made that up. I don’t know if I’ve seen that in the literature, but that’s how I think of it. This process is happening an average of nine years. Dr. Schoenfeld, he’s a neurologist in Israel, talks about primary biliary cirrhosis having antibodies for 40 years before it erupts. So we have Melissa Arbuckle, who published her research in 2003 in the New England Journal of Medicine. Since then, the research has really exploded. We don’t hear about it because it takes the medical establishment so long to change, but it’s right on the ADA website. If you swim in this, you understand that you weren’t healthy on Monday and had full-blown Lupus on Tuesday. It doesn’t happen that way. Jennifer: No. And I think that that’s a really good point. I know too that Dr. Kelly Brogan had mentioned that to me as well that a lot of women with Hashimoto’s, that autoimmune response has been ‘brewing’ – I like the word that you’re using – brewing for about seven years before it’s picked up. And conventional medicine doesn’t ever check for the antibodies. They don’t ever run that antibody test to thyroid tissue when they check a woman’s thyroid because they figure, “Well, it’s low thyroid. What difference does it make whether it’s autoimmune or not? We’re still going to treat you with Synthroid.” But it really does matter. And what you’re saying is the same, exact thing and it underscores the reason why we need to know if autoimmunity is in play. Tracy: I don’t work for Cyrex and I don’t have any ties to them, but I’m able to order the Cyrex Labs, so I know most about their testing. What I can tell your listeners is that we now have panels, Array 5 is the biggest one. It’s a comprehensive autoimmune screen. It identifies, it’s an early detection warning sign. It’s an enormous heads-up. I’m not trying to be judgmental at all, but it’s just that there’s an enormous amount of triggers and we know that triggers are part of that trilogy. So the array 5 test, it’s a small amount of blood (2 ml. ), it looks for 24 markers and it looks at all these different organs. I’m going to say this slow so people can really maybe take notes or think about it. There are test markers for: the brain, the bone, the thyroid, the heart, the liver, the pancreas, the digestive tract/gut, the joints and the testes and the ovaries. I want to clarify that it’s not every antibody known to man. Again, there are probably hundreds of them. I’m not an immunologist. I’m still just a nutritionist at the end of the day, but let’s say that you do the test. Let’s say you have type I, or Celiac, or you have rheumatoid, you have one autoimmune disease. Again, statistically, you’re at risk for more. So it’s worth considering to do a test like the array 5, which looks at all these different large organ systems and identifies if you’re brewing auto antibodies because, again, we know from Melissa Arbuckle that that’s a long process. So to me, it would be like finding out that in nine years, I’m going to be diagnosed with breast cancer. Well, what an enormous heads-up, right? That gives me time to start eating 100% organic, juicing every day, exercising, doing meditation, going to the sauna. I mean, I can see where people would maybe not want to know this information, but I also think that it could be an enormous blessing to people to find out that you’re at risk before you have all the tissue damage and the destruction and you lose the function of one of those organs that I’ve just mentioned. We don’t realize that you don’t want to cross those health bridges. You don’t want to get there. You want to stop the fire, right? We want to contain that forest fire while it’s small, not when it’s out of control. I agree. I mean, I think that although getting a positive test back whether it’s one marker or five, I believe it’s an opportunity. And there are a lot of people who get a cancer diagnosis or a heart attack, they have something happen and then they change their lifestyle and they’re healthier than ever. This can be an opportunity to be healthier than ever. It’s really the fork in the road. You can keep doing what you’re doing and hope you don’t get sicker or you can take the other road and get the information you need, make the lifestyle changes you need and be healthier than ever. Jennifer: Now Tracy, if as a general listener of this podcast, if I’m listening to this and going, “Well, you know, maybe I want to get this type of testing done. Do I have to go through my primary care physician or can I do this through another type of practitioner? I don’t know a ton about Cyrex Labs. I’ve maybe heard of them and I don’t quite know how to connect the dots and get my testing done.” What would you tell that person listening? How would they go about doing that? Tracy: You can and it should be done through a healthcare practitioner. Cyrex does not just sell the test to the average consumer. There’s education that should come with it. As I was preparing for this talk and talking to just friends and family, people in the community I know, there were a lot of people who said, “Oh, I have Celiac. I’d love to do that test.” And my usual answer is people have to be a patient in order for me to do any lab testing on them. But enough people said that to me that I’ve decided to put 30 combinations of Cyrex’ array 5 and a nutrition consultation to go over the test results on my website in the store. Meaning that if you’re listening to this call, and the spirit really moves you, and you are called to really want to know this. And you know that your healthcare provider is not going to know what you’re talking about because that’s the reality out there, then there are 30 on my store. And when they’re gone, they’re gone (it really isn’t the main stream of my practice), but I do understand there’s people out there who are going to want to know that. The other option is to go to your provider, see if they would get a Cyrex account. They’d have to just turn in their credentials and licenses and stuff. You know, a lot of these things that we’re doing, is educating people so that they go back to their provider. And sometimes, we’re educating our providers, so we get the kind of care that we want. Jennifer: Yeah, and I think that’s an important point just to empower you guys a little bit further. Most physicians, unfortunately, are getting a lot of their education at medical conferences, which are totally paid for and governed by drug companies and surgical companies and such, and the drug reps that come in to their offices. And a lot of the magazines that are for, say, endocrinology or any of those things, a lot of times, drug companies are ghost writing those articles and they pay consultants (which are the doctors) to then put their names on it. So there’s a huge problem out there that really good information is not getting out there. And I will point out too – FYI, everybody – until there is a Celiac drug of some sort, you’re not going to see an increased rate of diagnosis for Celiac Disease because there’s no push from the drug industry to train the doctors to look for it any better. There’s no reason for them to do it. It’s really sad. It was actually in a financial newspaper about a year ago, this whole, entire article. I did have a podcast to that. I will link up to it. Tracy, do you have any final thoughts that you’d love to leave us as far as if you’re struggling with your health, if you’re concerned you’ve got a history, a family history of autoimmunity, what are some words of wisdom where they should start right now? Tracy: Sure. I think if you’re sitting listening to this or reading through the transcript, I think the people that this is really indicated for are if you already have one autoimmune disease diagnosed, and you want to know if you’re brewing other ones. If you have multiple food sensitivities and you already know that or maybe your primary care person has tested you for intestinal permeability and you know you have a chronic leaky gut. Maybe you’re one of those people who carries the zonulin gene and you do just have a historically leaky gut. I would also recommend the test for people who are welders, cleaning ladies, carpenters. If you’re around a lot of chemicals. Maybe you went to the Gulf War and you got a plethora of vaccinations before you left, or if you have joint pain, fatigue, low-grade fever. Or last, but not least, certainly all the people on the call who are gluten sensitive because again, we all carry a gene for something. Just because you escaped the Celiac gauntlet doesn’t mean you’re going to escape some other autoimmune disease. And so I just think kind of that chronically sick person or if you have a strong family history. I think the people that this test is for are going to know it. Jennifer: Thank you so much for the information. I hope that we can have you back and talk hopefully a little bit more about this topic. I feel like we’ve really just – I mean, we talked about fighting forest fires today and hopefully trying to prevent them before they even get started and out of control. So that’s really cool. Thank you so much for joining us. Tracy: You are so welcome. Let’s remind your listeners that they could listen to Dr. Amy Myers talk about leaky gut and I have a whole bonus guide on leaky gut because again, we don’t get to change our genes, but the two things we do get to change are removing all those triggers (that 88,000 chemicals and all of that) and then also just working on the intestinal permeability. Those are really the malleable things that give people the hope, that yup, something is brewing and we don’t get to change our genes, but we can change these other things. So there is information out there. Jennifer: Cool! Well, everybody, please stay in touch with Tracy. You can visit her on her website at HealthyLifestylesMT.com. She’s also on Facebook, Pinterest, YouTube, Instagram, Twitter, Google+. I’ll put all the links below this so that you can easily just click through and follow her and connect with her. Tracy ahs got a great newsletter. And as she said, she is going to give you access to that array 5 if you’re looking for more information about it or you’d like to have it done. Tracy will help you in finding out what exactly is going on with your level – hopefully, it’s at a zero, but your potential level of autoimmunity. So thank you, guys so much for joining us. Remember to subscribe, rate and review this podcast and then head on over to Gluten Free School. Leave your questions and comments below. Tracy and I will try to get back to you and get some answers to you. Thank you, guys so much for joining us. I really, really appreciate your presence and your constant listenership and being a part of this community. I feel so blessed that I’ve had the opportunity to share this kind of information with you. So have a fantastic day! CLICK HERE to work with Tracy! Bethany is a graduate student in Human Nutrition working toward her Master of Science. She is a published magazine writer and graduated with her BA from the University of Michigan Dearborn. Since 2009, she has been diagnosed with food allergies to soy, peanuts, and peas and severe gluten intolerance. Her health manifesto is simple: Eat real food and remember to move. Hello, thank you for the information. I love your podcasts. A question – when it was said that statistically someone with an auto-immune disease like Celiac is likely to have seven auto-immune diseases throughout their lifetime, is that true for someone who sticks to a gluten free diet or only true for someone whose Celiac Disease is not properly treated? I believe that I had undiagnosed Celiac for about six years before being properly diagnosed, but I was told that those who do not follow the GF diet are at risk for other auto-immune diseases. You put it very well that you cannot be perfectly healthy on Tuesday and then develop a serious condition on Wednesday, but I am now a bit confused if someone is still at risk if they follow the GF diet.